Đorđe Vukadinović of NSPM had an interesting take on the Kosovo crisis in his latest column in the Belgrade daily Politika. He sees the issue as an outcome of a series of mistakes, on part of Serbs, Albanians, the West... mistakes compounded by errors, compounded by misjudgments. Sure seems that way. On the other hand, the West (that is, the U.S.) wrongly believed - assuming they did believe - that Kosovo was primarily a humanitarian problem, rather than a conflict of two irreconcilable claims, two ethnic groups and two nation-building interests (as well as several regional interests). 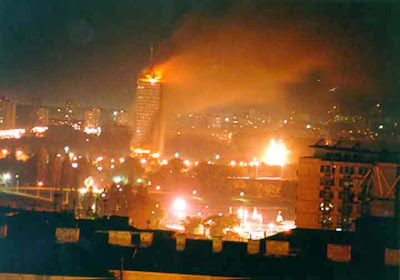 They erred in bombing Serbia (FRY) because of Kosovo, in the absence of UN Security Council approval, and lacking any legal or sufficiently moral justification. They erred even further when they tried to cover up that error with a claim of "genocide against the Albanians" and their "Gandhi-like resistance", systematically covering up the facts about crimes, atrocities and inhumane treatment of the remaining Serbs in Kosovo. Additionally, seduced by misinformation coming from their envoys in the field, the West miscalculated the degree of Serb interest in Kosovo, wrongly believed that "Koštunica is just bluffing“, that Tadić would agree to independence, and that Kosovo is "number five or six on the Serbian national priority list“. They miscalculated the Russian position and possible role in the Kosovo crisis, constantly telling Belgrade that Serbia cannot count on a Russian veto in the Security Council, that Putin would make a deal with Bush and that "the Russians will sell you out in the end." Worst of all, this sort of policy and the promises - direct and indirect - that they will get independence as "reward for their suffering under Milošević“, have made the Albanians so entrenched, they reject any offer that falls short of this, no matter how favorable, as unjust. Finally, a portion of the anti-Milošević opposition took their propaganda about "Kosovo as primarily a democratic issue" too seriously, and contrary to experience and common sense began believing that the problem of Kosovo began with Slobodan Milošević and that it would end with his departure. Part of this opposition corps that came to power after October 5, 2000, saw Kosovo as ballast to be discarded as soon as possible, believing - erroneously - that this would be met with support, or at least acquiescence, by most Serbians, as they become dazzled with European stars and supermarkets. They were mistaken. Everyone, therefore, erred, and now everyone stands to lose. Serbs most of all, but also the U.S., the Albanians, Western interests as well as the "European agenda" in Serbia itself; let alone the international law and order. I think many now see the status quo ante  as a less-bad outcome for everyone. The question now is if anyone is at the controls, and if there is time for anyone to slow down or change the course.